Short-term exposures to fine particulate air pollution and ozone—even at levels well below current national safety standards—were linked to higher risk of premature death among the elderly in the U.S. according to a new study from Harvard T.H. Chan School of Public Health. The risk was even higher among elderly who were low-income, female, or Black. The study will be published December 26, 2017 in the Journal of the American Medical Association (JAMA). 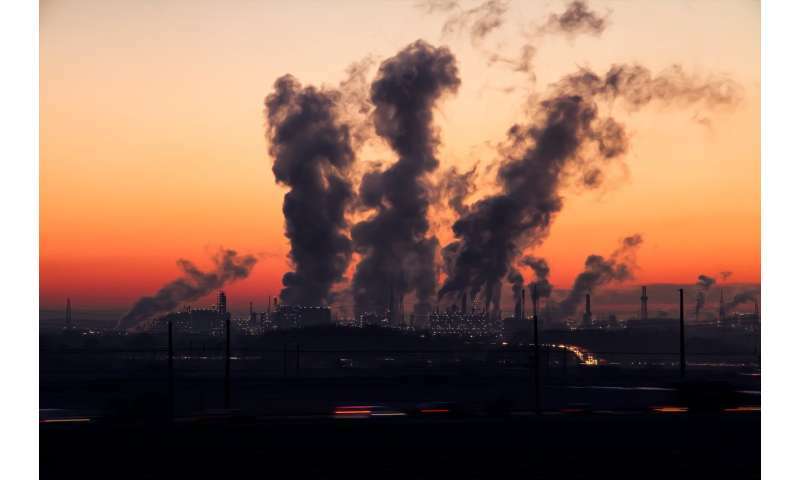 "This the most comprehensive study of short-term exposure to pollution and mortality to date," said Francesca Dominici, professor of biostatistics, co-director of the Harvard Data Science Initiative, and senior author of the study. "We found that the mortality rate increases almost linearly as air pollution increases. Any level of air pollution, no matter how low, is harmful to human health." Studies have shown that fine inhalable particles (PM2.5) and ozone—particularly 'warm-season ozone,' which occurs from April to September—are linked with increased mortality rates. Under the National Ambient Air Quality Standards (NAAQS) set by the U.S. Environmental Protection Agency (EPA), long-term exposures to PM2.5 are considered safe if they average 12 micrograms per cubic meter of air (12 μg/m3) or less per day over the course of a year. The 24-hour standard is 35 μg/m3. For warm-season ozone there is no annual standard; the 8-hour standard is 70 parts per billion (ppb). The researchers assessed daily air pollution exposures using prediction models that provided accurate estimates of PM2.5 and ozone for most of the U.S., including unmonitored areas. They then linked the air pollution data with mortality data from the entire U.S. Medicare population residing in 39,182 zip codes (93% of all the zip codes in the U.S.), over a 13-year period from 2000-2012. During the study period, 22 million people in the study population died. The study found that, for each 10 μg/m3 daily increase in PM2.5 and 10 ppb daily increase in warm-season ozone, the daily mortality rate increased by 1.05% and 0.51%, respectively. While this may seem a small increase, the public health impact is enormous if it's applied to the whole U.S. population of seniors, according to the study authors. For example, an increase of just 1 μg/m3 in daily PM2.5 over the course of one summer in the U.S. would lead to 550 extra deaths per year and 7,150 extra deaths over the course of the 13-year study period. An increase of just 1 ppb in daily ozone over the summer would lead to 250 extra deaths per year or 3,250 extra deaths over 13 years. Certain subgroups were particularly vulnerable to short-term air pollution. Among Medicaid-eligible (a proxy for low income) recipients, the mortality increase linked with increased PM2.5 was three times higher than that of people not eligible for Medicaid. Women and nonwhites also faced a mortality risk that was 25% higher than those who were male or white. Poverty, unhealthy lifestyle, or poor access to healthcare may play a role in such disparities, the researchers speculated. A June 2017 study by some of the same Harvard Chan researchers found that long-term exposure to air pollution was linked with an increased risk of premature death, even at levels below the national standards for long-term exposures. Those results are playing a key role in a current review of the annual NAAQS by the EPA. Joel Schwartz, professor of environmental epidemiology at Harvard Chan School, said that the new findings about the short-term mortality risk from air pollution suggest that the EPA should re-evaluate the daily NAAQS as well. "No matter where you live—in cities, in the suburbs, or in rural areas—as long as you breathe air pollution, you are at risk," said Qian Di, lead author of the study and a PhD student in the Department of Environmental Health.